I upgraded by Windows 8 to Windows 8.1 a couple of months ago and since the change I was getting blue screens (of death…) consistently. This issue was do to a piece of memory that was incorrectly over written, my RAID drivers were also failing. There really wasn’t anything important on my Windows partition so I decided to delete the partition and reinstall Windows 8.1 as a fix. There are helpful debugger tools to deal with this along with memory tests but it was just as easy for me to delete and start over. The following instructions apply to an Intel Motherboard. 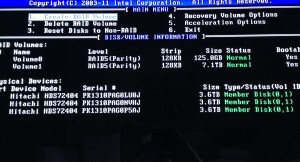 Turn on the computer and during the first screen that flashes the manufacturer name (the screen before the Windows logo) enter the BIOS menu. The screen flashes quickly and for those who don’t know how to enter this screen, it’s normally a F key. The manufacturer screen normally has on it a list of key options, just look for the one that will get you to the BIOS configuration (Don’t worry if you miss it, just keep shutting down the machine and turning it back on until you get it). For me, the Intel key was “F2”. 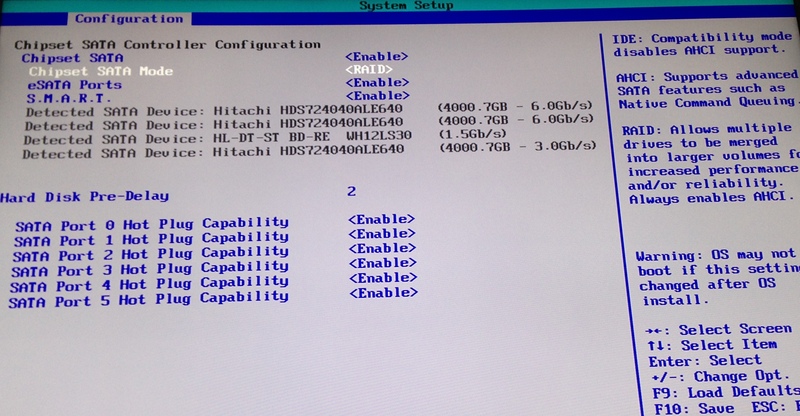 Under the configuration tab in the BIOS, set the “Chipset SATA Mode” to RAID. Directions on how to change values are displayed on the right hand side of the screen. 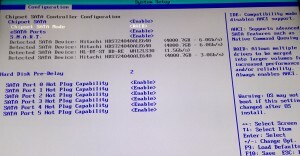 Save changes and exit the BIOS screen (ESC key). Reboot the computer. There should now be an additional screen that appears between manufacturer screens when you start the machine up. This lists all your RAID volumes. 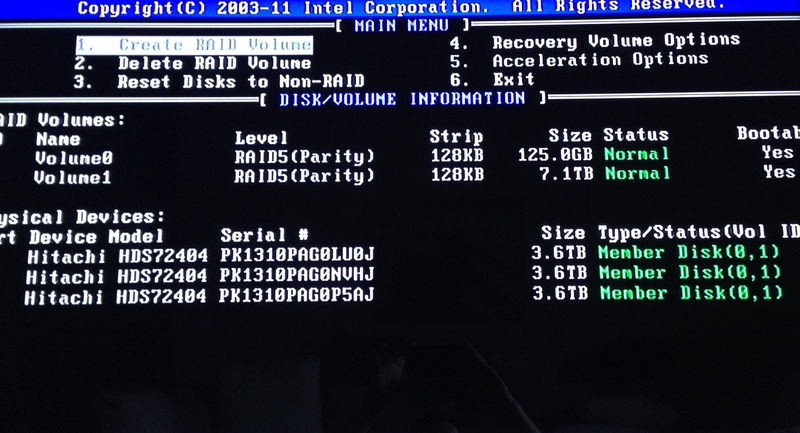 Quickly, press CTRL-I to get to the RAID configuration utility while the screen is up. This was actually tricky for me, I had to make multiple attempts. For some reason, I could not get this to work on my bluetooth keyboard but it worked with another keyboard… some bug. Even with a different keyboard, I basically held down CTRL and went crazy pressing “i” over and over and over again. In this window you can create RAIDS! Choose option 1 to create your volumes or look at the other available options for different functions. My settings consist of two bootable RAID 5 volumes across my three ~4TB (3.6TB actual) hard drives. One with 125GB and the other with 7.1TB. The screenshot below shows my setup for your reference. Depending on your setup (RAID 5 requires at least 3 hard drives), you may want to do some research into RAID and your options. I chose 5 because it is supported by my motherboard and provides mirroring/striping. So it optimizes parallel communications and provides redundancy. In the case that one of my hard drives fails, I won’t loose anything. 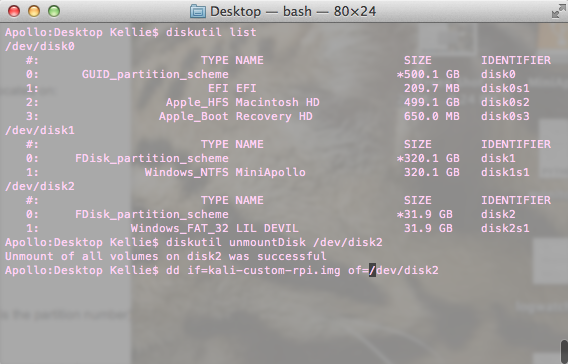 If two hard drives fail… I’m screwed. Basically, you have some protection from failure but still replace bad hard drives ASAP. Download the Intel RAID drivers from their website and put them on a USB device. The screenshot above shows the driver I downloaded. Keep the USB plugged in during the following steps. I had a DVD with a Windows 8.1 ISO burned to it. This was placed into the computer before I shut it down. I then turned the computer on and again during the manufacturer/first screen, I hit the “F10” key to select from where to boot. 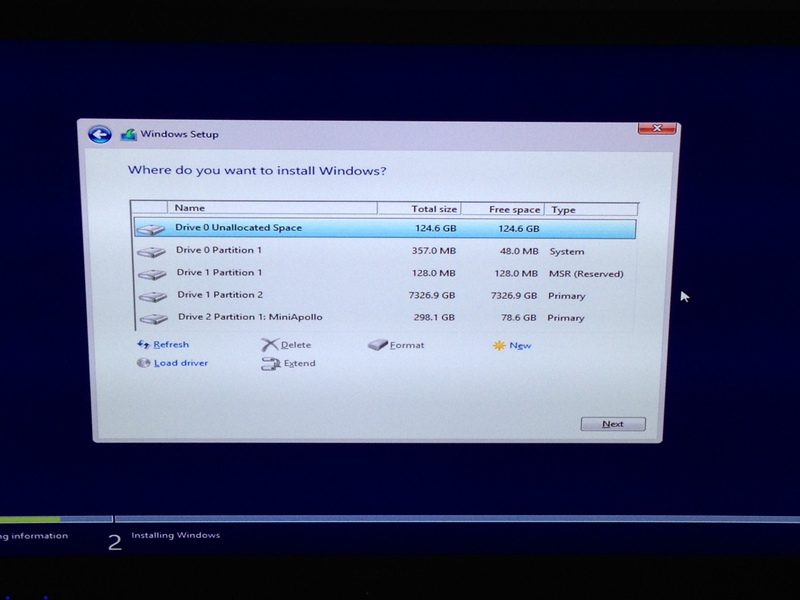 Most of the time, by default you boot from the Windows partition on your hard drive. 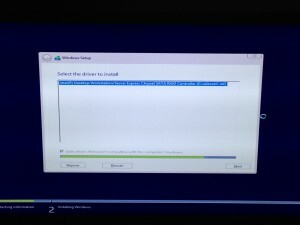 However, this time, I wanted to boot from my install DVD containing Windows 8.1. The next few screens deal with entering your license key and junk. Once I was prompted for Default or Advanced setup. I chose Advanced. This was because I needed to mess with the partitions. After a few minutes, you will be returned to the partition window and you should see you RAIDs correctly. 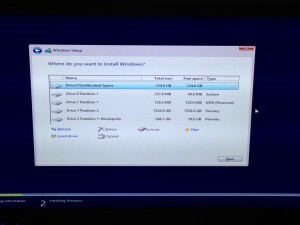 Format a new partition for your Windows (I deleted the previous). In my setup, I have 8 TB of hard drive space. I dedicated 124 GB to my Windows partition and the remainder to a partition I call “cabinet.” This is where I store my documents, media, etc. Windows does have a problem with creating a partition greater than 2TB. These drives must use GPT. 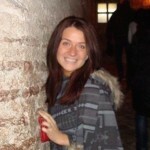 This page discusses more on GPT. If this is what you plan to do, don’t partition the larger now, wait to use the Windows disk utility described in the link. 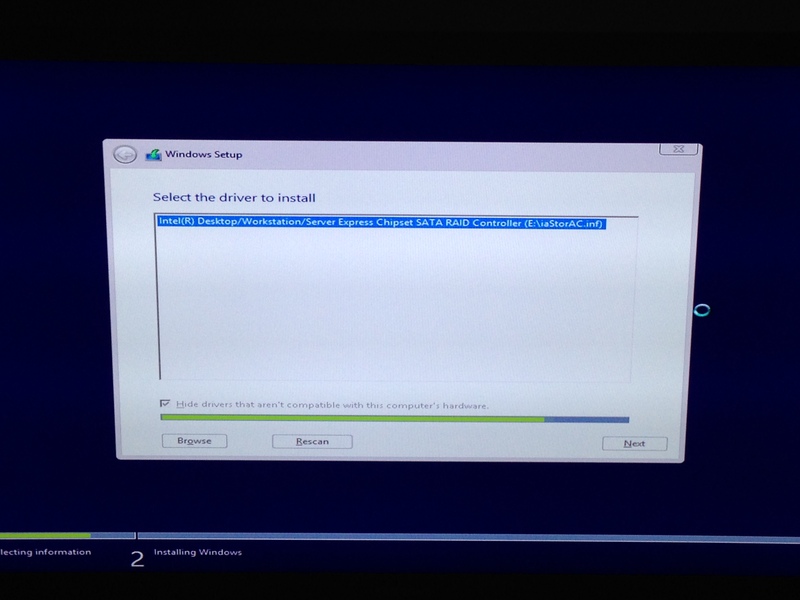 Continue and let Windows install. Was completed, install drivers as needed. Intel has a tool that helps with this process. Just bought my own Raspberry Pi (Model B), endearingly named the Lil Devil. I’ve worked with Pi’s at school but now I have my own, sweetness. 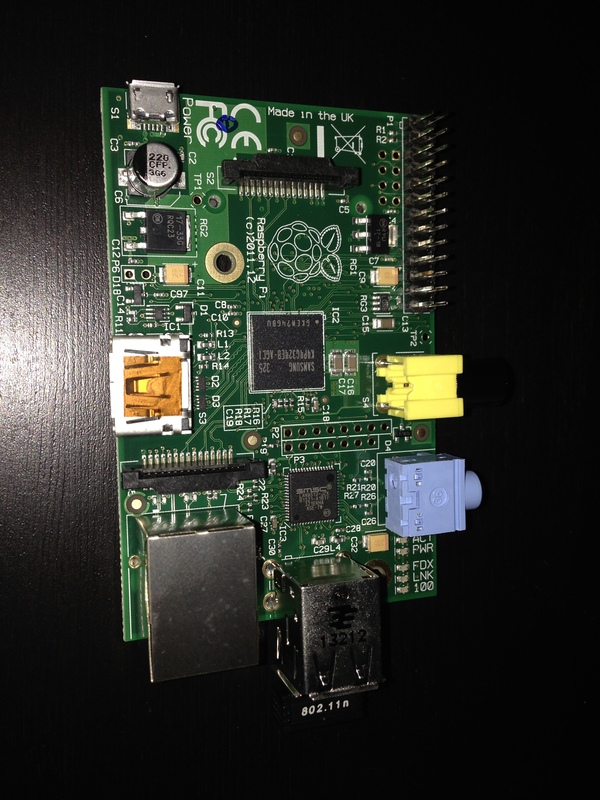 “The Raspberry Pi is a credit-card sized computer that plugs into your TV and a keyboard. It is a capable little computer which can be used in electronics projects, and for many of the things that your desktop PC does, like spreadsheets, word-processing and games. It also plays high-definition video” (raspberrypi.org). So now that I have one, I’m going to put Kali back on it along with OpenVAS, see previous post. With the SD card inserted into your computer, check where it is mounted with either fdisk (Linux) or diskutil (Mac). Locate your SD. Mine was located at /dev/disk2 (seen in screenshot below). Lastly, use dd to image the SD card, the command is the same on both platforms. You can either use a custom Kali Pi image or a normal Kali image. WARNING: Make sure to select the write SD location, you do not want to wipe your computers HD! This may take some time depending on the size of your SD. Plug all the pieces together (HDMI cable, mouse, keyboard, WiFi adapter, USB to power supply, and SD). The default credentials for Kali is root:toor. This was super annoying but dd did not image my entire SD card, it made a small 4GB image (The size of the image I had, most pi images are 2GB from what I hear.) I ended up installing raspy-config in order to expand my image partition on the card. I followed these instructions. Once I had my PI going, I checked that the WiFi was working correctly. I followed this tutorial to get it working. Following, I was able to SSH immediately (I found the IP address on my router’s web interface), some of you might have to configure OpenSSL. This way you can SSH into the device without the need of a dedicated monitor, HDMI cable, keyboard or mouse. Always good to update your libraries and upgrade your system. Cool, the environment is now ready for whatever you want to do. If you are worried about security, bastion.sh is a really cool tool designed to tighten security on any Linux device. Worth trying. More Pi fun to come!